Familia C: Loving Each Other Through It All: Look at Sarita's Favorite New Doll! Everyone's kids know, they can't play with La Chiquitita's doll. But Sarita gets to. Well, when no one else is around. My daughter is spoiled! What a good Nana she has. This year, for Sarita's birthday, this was one of the presents she got from her Nana! How sweet was that? 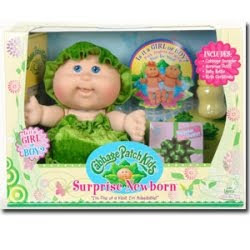 Now, my daughter has her very one Cabbage Patch Kid! Just her size too! Because with this cancer, our daughter looks a lot younger than she is. Let's just say, she's growing very, very slowly!